The consciousness about universe has been changed for me during past two years ! Ms. Ryoko Hirama tolled us. Ms. Ryoko has act as a secretariat for 21st AIAA ICSSC. She worked with AIAA H.Q. and Japan Forum on the establishment Satellite communications Conference in Japan. Hard negotiation in order to summarize the many opinion of the satellite communication specialist in Japan and the U.S.A was most critical job for her, but she has done remarkable activity with enthusiastic manner. -- It is alike and tells us. "Digital Satellite Broadcasting and Digital Multimedia Broadcasting" by Yutaka Kazekami, Senior Editor, APSCC (Asia Pacific Satellite Communications Counsel) Workshop 'Digital Satellite Broadcasting and Digital Multimedia Broadcasting' was held in the Lotte Hotel Jeju Island Korea from March 23 to 25, 2004. A Handheld Terminal for S-Band Mobile Satellite Systems FUJITSU was developed the handheld type mobile phone which can communicate through a S-band mobile satellite (ETS-‡[ as an example) under guidance of Communications Research Laboratory. The following are the features. It is under reconstruction so that data etc. can be treated and they are under evaluation now. Although the bit rate is low, the conventional satellite earth station is the thing developed with the different concept. 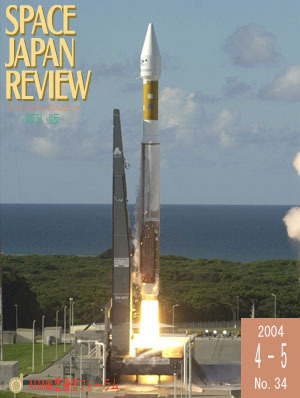 "Challenge to manned and unmanned space exploration technology"
2004 General Conference of IEICE was held in Ookayama campus of the Tokyo Institute of Technology was held in March 22-25, 2004 and special session KB-4 was conducted on March 23, 2004 where chairman of this session is Professor Yoshinori Sakai (president of Communication Society of IEICE, professor of Tokyo Institute of Technology). The title of this session is "Challenge to Manned and Unmanned Space Exploration Technology".